Life is full of quandaries, some more debilitating than others. To pee or not to pee, that’s my question every time it’s raining, but other challenging dilemmas include, life, health and companionship. 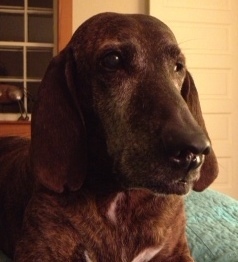 I’m Lazarus, a blind, 13-year-old Plott Hound who has fought a bear, wandered lost through the mountains and eaten a blanket – with the scars to tell each story. I’ve learned we all have quandaries we wish would solve themselves: to turn right or turn left when lost in search of our destination; to take or not take the medicine that both heals and hurts our body. Sometimes we wish for a greater Being to make the choice – the right choice. It’s not that we don’t want to have control over our own lives it’s that we don’t want to suffer the consequences of being wrong, of being lost or uncomfortable. To many, life as a dog seems simple, although there are greater decisions than what to eat, where to sleep and when to take care of our business. Quandaries lead us into deep thought and the decisions attached to them help us determine what type of dog we are. Walter M. Miller, Jr. once wrote, “You don’t have a soul ….. you are a soul. You have a body, temporarily”, and being an older dog I think this through daily. Who decides how long my life will be? Am I who determined the outcome of my body’s many near-misses with death? If so, do I choose when to leave my failing body, and my caretaker’s then-shattered heart, behind? Where is the universe taking my soul, and exactly who is leading the way? Not all outcomes, whether made by greater or lesser Beings, make sense to us. If we leave our choice of the right or left turn to the flip of a coin or the will of the universe we may correctly find our way or we may inadvertently discover paradise or we may get a traffic ticket. Consider how many questions we get in a day, each needing an answer, each providing a lesson, all developing wisdom. Should seemingly silly questions be decided by a coin toss? Does a quandary require a nap? Each of us makes our own decisions with the answer setting our course. Treat the path with respect. Now excuse me, I’ve decided to pee. The post Questions & Quandaries appeared first on BioStar US.